The young girl could not stand on her own legs. After two weeks of Dolphin Therapy great progress has been made. Manuela Lenuweit is a happy woman. Without a doubt. The 47 year-old is tanned, the worried look in her eyes has given way to laughter wrinkles and her demeanour radiates newly-won strength. Manuela Lenuweit is above all a happy mother. The mother of eight year-old Victoria, for whom people in Priestewitz, Großenhain and other towns and villages donated a lot of money. A fund-raising campaign mounted by the SZ local editorial office in Großenhain and the Priestewitz community raised over 15.000 Euros. 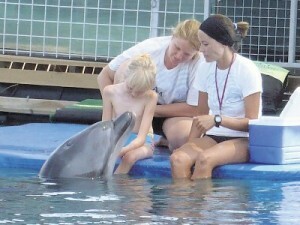 The dolphin therapy in Marmaris, Turkey, cost 9450 Euros which the family were unable to pay. „That was a blow for my husband“, said Frau Lenuweit. „He was always working but so much money was not available for our little one. The situation was continually a burden for us.“ Since the time this was publicized in the SZ on 5 May the life of the worried parents changed considerably. Victoria has made progress, is more balanced and in August was able to kneel. An event for the parents that was like Easter, Birthday and Christmas all on one day. Then the time arrived. After all the hope and years of waiting the Lenuweits began packing. 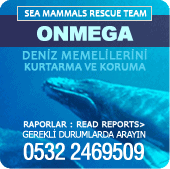 On September 2 they flew to Turkey. Along with the luggage were not only Summer clothes and toys but also especially lots of wishes. Looking at Manuela Lenuweit today, one can see that these wishes all came true. „Victoria had surprisingly no problems with settling down. Already on the second day she had adjusted to the routines of the Hotel and Therapy Center“, she said. A strictly organized course that, for the blonde girl who is organically healthy, meant a lot of hard work. In the mornings there was Cranio Sacral therapy – a procedure which involves manual pressure on the skull and sacrum. This was followed by Hippo therapy and meeting the dolphins. „Every child works with one animal. At first the child learns to trust the animal through the therapist. Afterwards they are both moving in the water together completely unafraid,“ says the Lenuweits. Victoria’s 290 Kilogram friend from the sea is called Flip. And in the following fourteen days that the little one spent in the Therapy Center he pulled all the stops. Not only that the girl could, after only a short time, move alone in the water with a swimming ring, but also from session to session she became calmer and no longer made hectic movements or, as was typical, screamed in fear. All of a sudden she could sit on her own without support. Before, she could only make sounds, then we heard words forming, and she spoke the word „ja“. At one point she came to Mama for a cuddle. „That was a very special moment for me“, said Manuela Lenuweit. „Victoria embraced me not because she sought help, but for the first time consciously wanted to show love.“ A moment for which she could have kissed Flip.